I’ve decided to wait to transfer them until the end of the week. It has been cold and blustery and snowing on occasion and even though the top bar might be warmer, they are doing ok where they are as best I can tell. 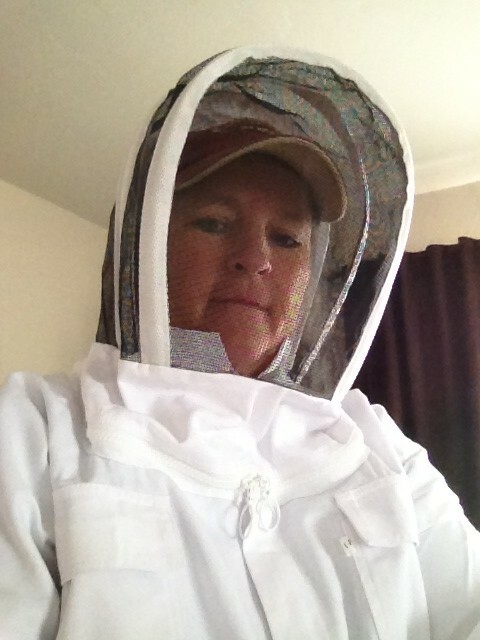 Which means they are buzzing. Peeking, which is what I reallyreally want to do, would release precious heat, so I’ve refrained. They may have comb started by then, and it will be fragile, but this plan is the best I can do for them, in my humble opinion! 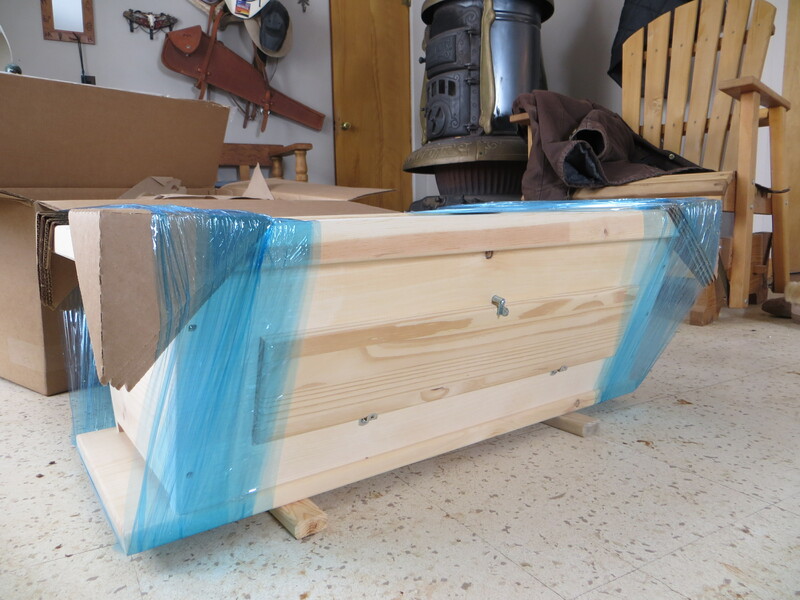 The company doesn’t recommend painting the hive, but I’m rather fond of oiled wood, so that was what I was going to do… Wyoming is very hard on unfinished wood, so I thought tung oil wouldn’t be too bad. Problem is, I have Tung Oil Finish, which, surprisingly to me, is *not* pure tung oil, and not recommended either. I’ve thought about perhaps using some Old English Lemon Oil or coconut oil… any woodworkers have an opinion? Bees have very sensitive noses… who knew?… so perhaps coconut isn’t the way to go. I don’t want to attract ants either. I have two days to make up my mind! As soon as my hive arrived, Vernon requested I take my dogs and kick some cows off the fence. Whoopee! I love having that job! I did have to play with the hive just a bit, and then I dressed warmly and headed out. It was snowing lightly and blowing, and I was hoping the hike up the hill would keep me warm. Arriving at the fence, it was easy to see this wasn’t a good plan. Five cows stood around babysitting perhaps 25 calves. 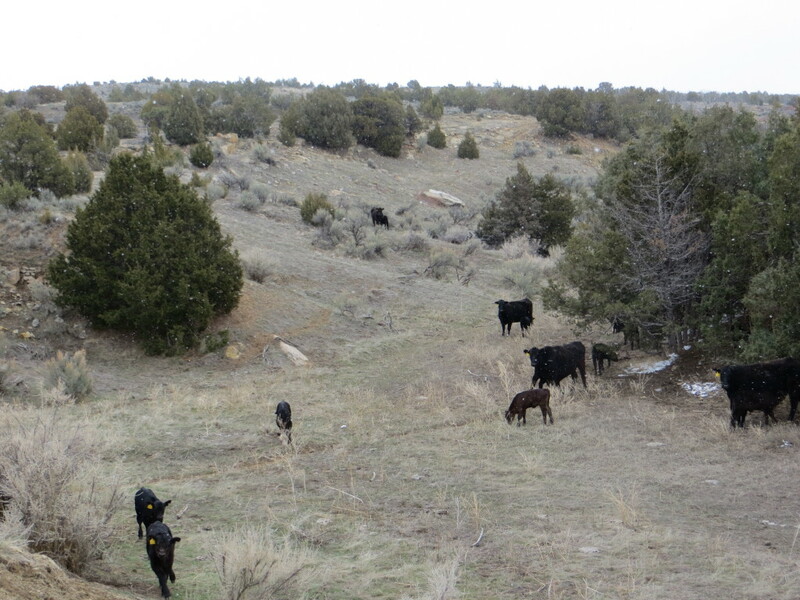 Taking calves up a hill and out of sight of their mommas is not recommended even if I could have done it. Most likely the calves would split 25 different ways, and I didn’t want to bum anything that wasn’t smart enough to reunite with their mother. The dogs and I jumped back in the car and met the guys bringing more pairs to kick into the same pasture. I followed along, half of me missing the job, the other half grateful for the warmth of the car as the snow swirled around! 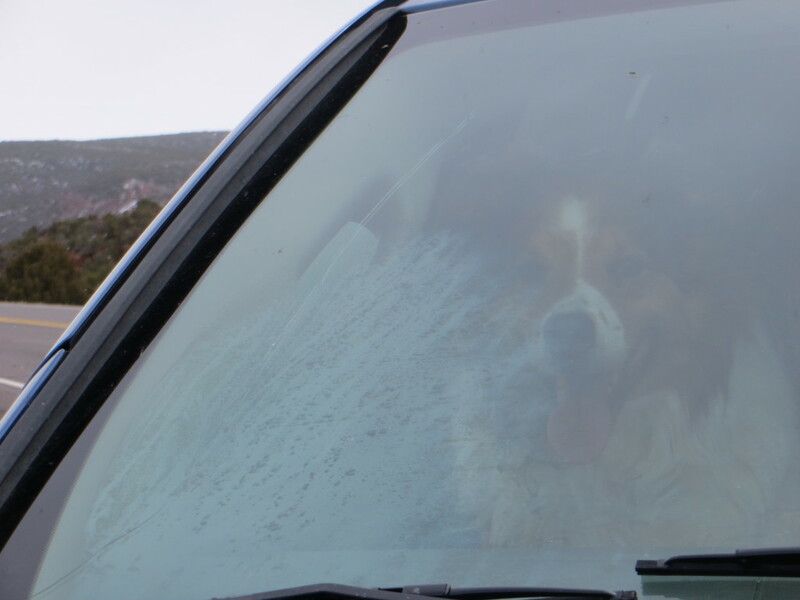 At the gate, I jumped out for a chance at some photographic moment… but the one that made me laugh was when I returned to the Durango to see Lucas, sitting in the front seat, his excited breath fogging up the window! He’s supposed to stay in the BACK, but it was just too exciting to miss! Me? I might be too excited myself! I’m way late, but, the Barefoot BeeKeeper says to use 1 part beeswax to 20 parts linseed oit. I put it on my topbar hives and it lasts fairly well and smells good to me and should smell good to the bees. You might check on mineral oil. Good luck figuring out if/how you should finish the outside of the box. Never a dull moment is there. Welcome to Red Dirt In My Soul. 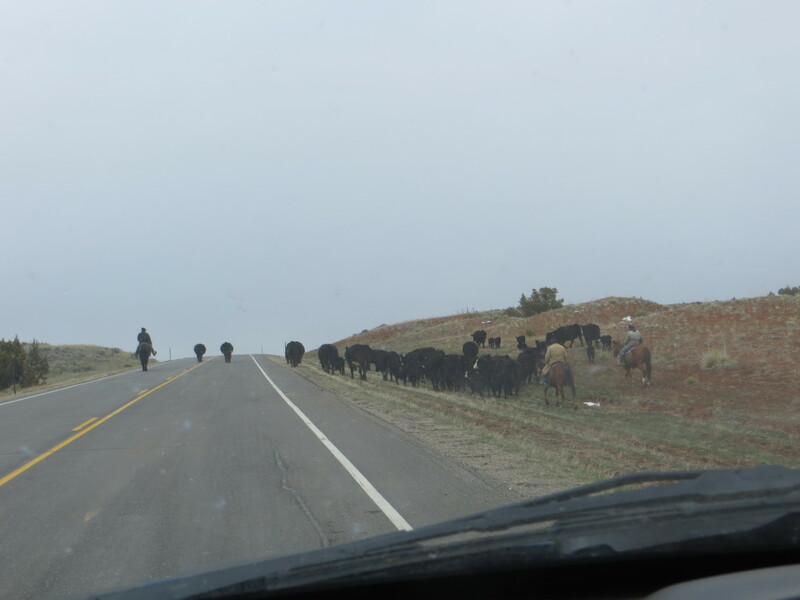 If you're interested in the western lifestyle, curious about where your beef comes from, or just love Wyoming's wide open spaces... this blog is for you! Since 2008, I've tried to capture my life on our Wyoming Centennial Ranch. That includes cows, cowboys, four generations living and working together, scenery, wildlife, and my various projects from remodeling to crafting! Enjoy a movie, ask a question, and spread the word about Red Dirt! Enter your email to receive some Red Dirt in your inbox! 04-25-13: Wordless Wednesday - "Chieftan"